Some mornings call for emergency measures, and this was one of them. I was so hungry, hungry beyond words although my stomach had a lot to say, noisily growling and grumbling throughout the morning. I should have planned ahead and packed a snack to take along for a super early appointment, but I didn't. So today it was all about fixing something healthy and tasty for breakfast when we returned home after 10:00 a.m. Emphasis here on breakfast: it felt like a fast... deprivation... hunger pangs... A quick batch of mini frittatas came to the rescue with two apiece for us this morning and a couple more to spare. Why use a muffin tin instead of the usual pie plate for a frittata? 6 large muffins bake faster than 1 whole pie, and the servings are much easier to save, store, reheat (or not) and grab to eat on the go. Why not use the microwave instead of the slower oven? I think microwaves change the taste and texture of cooked eggs, making them less pleasant to eat. I was hungry, but not desperate. What's your favorite filling? Whatever veggies and cheeses I find in the fridge. Bacon is always good, but not essential. 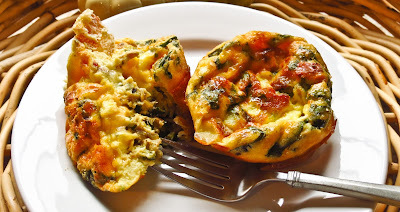 Mini frittatas aren't anything new, but I hadn't thought about them in ages. A friend's recent Paleo conversion brought these eggy treats to mind again. (Note: my version incorporates dairy, thus is not Paleo.) It took mere minutes to nuke the bacon strips, shred some basil, chop a few vegetables and cheese chunks, then whip up the eggs and milk. Divide the ingredients equally into six large prepared muffin tins, pop into a preheated 375 F oven and presto! finished minis in the minutes it took to prepare a fresh fruit plate, make coffee and set the table. Mix the filling ingredients together (or do each one at a time) and distribute equally among the 6 prepared muffin cups. Whisk the eggs, milk and seasonings together to blend well in a medium bowl and pour over the filling so the muffin cups are about 3/4 filled. Bake 12 to 15 minutes, or until set in the center and lightly browned. 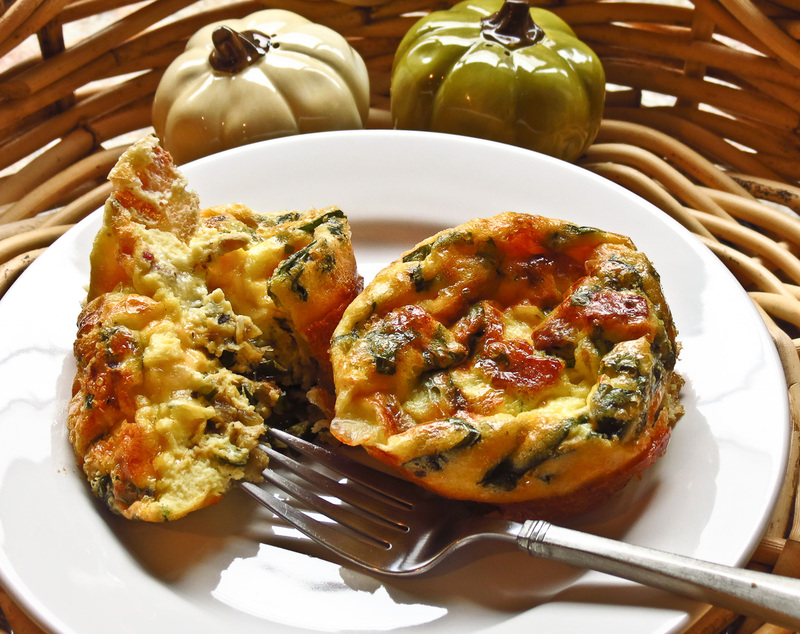 Gently run a rubber spatula around the edge of each frittata to loosen from the muffin cups. Use the spatula to lift and remove from the pan and serve. Updated note: Here it is, the day after my hungry morning grumble, and I'm riveted to the televised images of the devastation along the East Coast in the aftermath of Hurricane Sandy. Now there's a real emergency, and I can't imagine what those people are dealing with. Yesterday I was just a little hungry - today millions of people are looking at challenging weeks/months ahead dealing with basic needs, things like shelter, food, water and power, transportation. Then there's the rebuilding of the infrastructure... it's beyond imagining. Blink! my eyes flew open and I could tell it was far too early to be awake. The bedroom was dimly lit with the reflected glow of city lights bouncing back off of the heavy cloud cover, but at zero dark early the sun wouldn't rise for several hours yet. The house creaked, the husband snored, the clock loudly ticked away with metronome precision, and there was no way I could fall back to sleep. Sigh, now what? I wandered downstairs to the kitchen, looking for a distraction, any distraction, and found one in this bright red package. Dessert for breakfast... why not? Gasp! a store-bought pie crust? My secret is out, it's just one of the quick-fix items I keep on hand for emergencies like unexpected company... or in this case, a sudden craving for something sweet. Emergency stores are found all over my kitchen and galley, in cabinets, fridge and freezer. I love to cook from scratch, but it's reassuring to know some versatile convenience items are also available, ready to turn into something delicious on very short notice. Was I just being a considerate wife, trying not to wake RL... or was I too focused on consuming a fast, sweet after-midnight treat? Whatever my excuse, that red package quickly launched a rustic apple crostata project. I took a few shortcuts, didn't refer to a recipe, and luckily it didn't matter. My early morning wedge was just what I craved, and RL enthusiastically enjoyed several servings later in the day. Step One: Roll out one round of piecrust, thinly spread mango jam on top leaving a scant 2-inch border, and sprinkle a handful of sliced almonds over the jam. Step Two: Peel, core and thinly slice 3 very large apples for the filling. 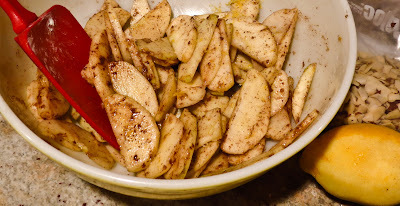 (I used 1 Granny Smith and 2 HoneyCrisps, because that's what I had on hand) Mix together some sugar, flour, cinnamon, nutmeg, lemon zest and more almonds. Add to the apple slices and toss to coat. Step Four: Bake in a preheated 425 F oven for 20 to 25 minutes until the crust is golden brown and the apples are tender. Serve warm or at room temperature. 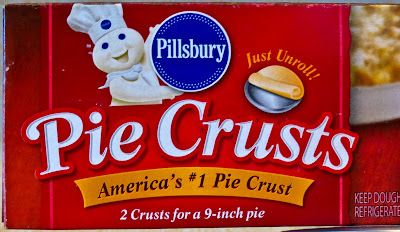 Prepare the dough according to package directions or your recipe. Spread jam evenly over the surface, leaving a border of 1 1/2 to 2 inches. 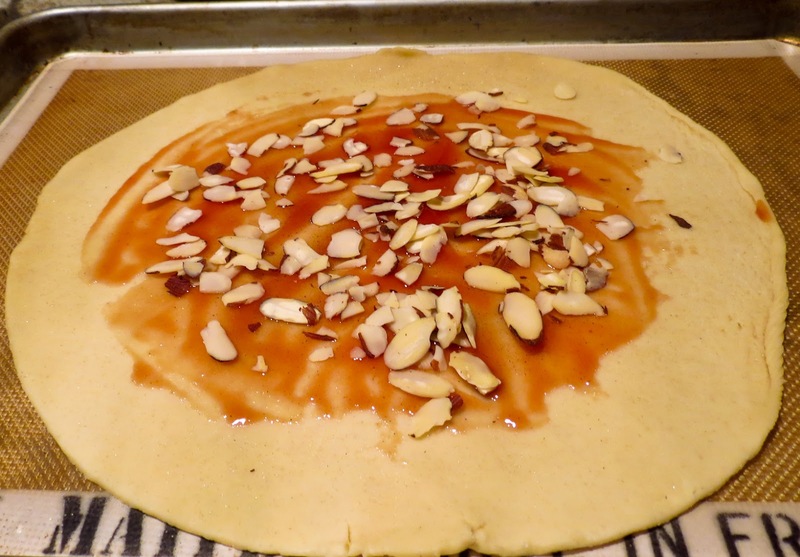 Sprinkle half of the almonds over the jam. In a large bowl combine the sugar, flour, cinnamon, nutmeg, lemon zest and the remaining half of the almonds. Mix thoroughly. Peel, core and thinly slice the apples. Add them to the sugar mix and toss or stir to coat each slice. Cover the dough with the apples, again leaving a border of 1 1/2 to 2 inches. Pat firmly and rearrange slices as needed to fill in the gaps. Fold the border over the filling, folding and pleating as needed to form a circle. 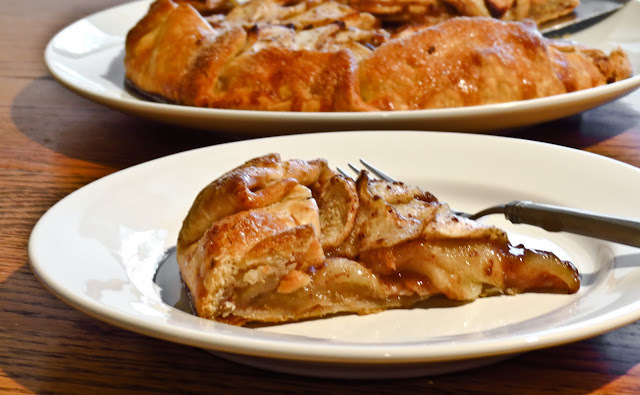 The center will remain open, exposing the apple filling. 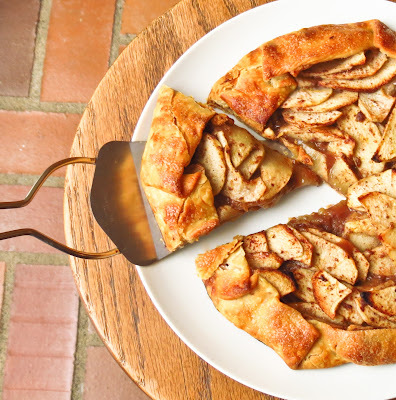 Bake in a preheated 425 oven until the crust is golden brown and the apples are tender. Place on a baking rack to cool until the juices have time to set up a bit. 1: Before baking, brush the folded top crust with beaten egg white and sprinkle lightly with sugar for an attractive, sparkly finish. 2: Add the last half of the almonds to the apples. Add 1/2 stick cold butter to the sugar mixture and cut in or pulse in processor until crumbly. Sprinkle the crumbles over the top of the apple slices before folding up the dough for a crunchy topping. Beef Carbonnade comes to mind as the perfect meal on a blustery day, simmering for hours and perfuming the kitchen with its wonderful aroma. 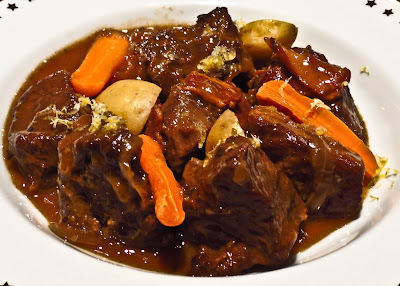 This stew is actually a multi-season favorite, delicious at home in Fall and Winter and just as welcome in the boat galley in Spring. My current recipe began as an onboard solution to cooking as we cruise. A crock pot is a handy cooking aid in a boat galley. It's an efficient way to cook soups and stews during long passages, especially those really long all-day passages in rough water. My slow cooker plugs into a 12-volt outlet and sits securely on a wooden bread board deep inside the sink as we travel. It stays solidly in place, cooking away comfortably for hours, even when the boat is rocking and rolling. For recipe inspiration I often turn to The 150 Best Slow Cooker Recipes by Judith Finlayson. Who knew that a 10-year old paperback cookbook would hold so many recipes to treasure? When I'm ashore I prepare many of the same recipes with a slow,low cook on stovetop or in the oven instead of using my well-traveled crock pot. Grrrrrrrl - that's my stomach growling in eager anticipation just thinking about Finlayson's recipe for Beef Carbonnade. Will power fades while the stew slowly simmers, and I find myself drawn to perform countless taste tests to sample the gravy. OH! that gravy, sweet and savory with a mellow deliciousness that draws me back to check the flavor, over and over for "just one more spoonful". After two hours at a bubbling simmer the onions melt away, adding body and sweet, deep flavors to the now-silky gravy. The final sweet-sour adjustment with brown sugar, vinegar and lemon juice or zest balances the flavor to perfection. Add cooked carrots, mushrooms and potatoes to the stew and it's a filling meal, or serve it plain over wide noodles or potatoes and savor each rich, mellow, satisfying bite. 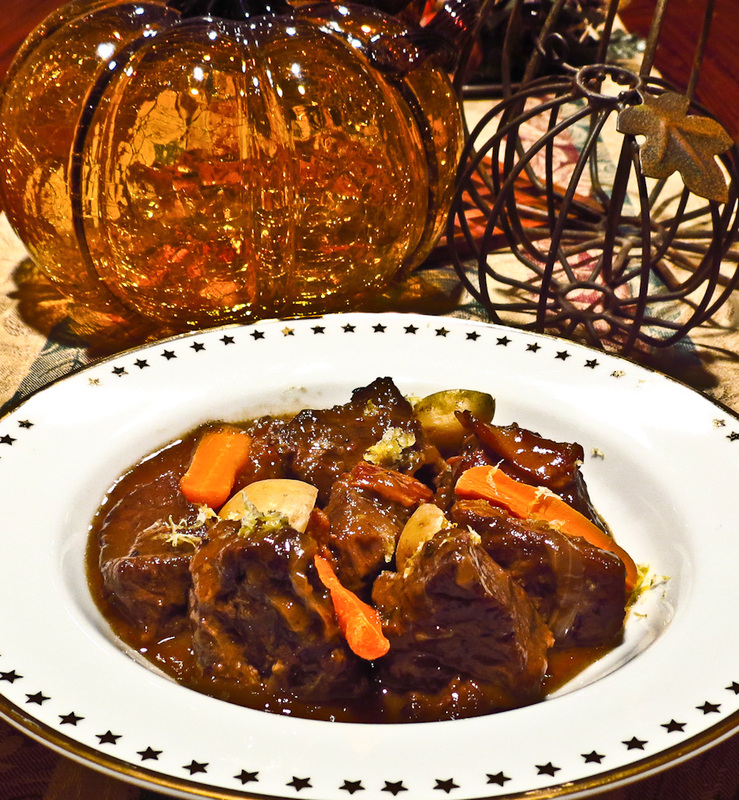 "After adding the beer, take enough slices of bread to cover the top of the stew, spread a nice, grainy mustard on one side of each slide, and something sweet on the other -- I use pear syrup, but something like apple butter works too. Place the bread, butter side down, on top of the stew, put the lid on, and let cook as directed above. About 20 minutes before serving, when the bread is nice and soggy, stir it into the stew, ensuring that it is completely broken up and incorporated into the stew. Aside from adding flavor, the bread will help thicken the stew." No thank you, I'm not tempted to experiment with bread and jam, not when the basic recipe is so terrific without much tinkering. In a heavy-bottomed Dutch oven or cast iron deep skillet, heat oil over medium-high heat until the oil shimmers. Add the bacon and cook until crisp. Remove with a slotted spoon and set aside. Drain off all but 1 tablespoon of the fat in the pan. In the same pan, over medium-high heat, brown the meat well on all sides. Do this in several batches taking care not to crowd the pieces; you want to brown the meat, not steam it. Remove with a slotted spoon and set aside. 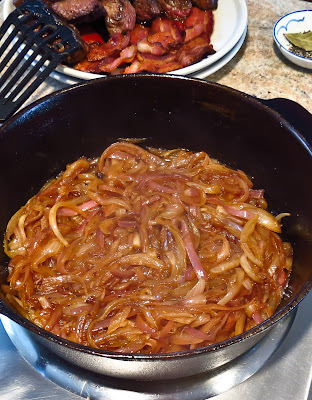 Reduce the heat to medium, add the sliced onions and cook until soft and lightly caramelized (but not crisped). Stir often to keep them from sticking to the pan. Add the garlic ,spices, salt and pepper; stir and cook for 1 minute or until fragrant. Sprinkle the sugar over the mixture and stir to blend. Add the flour and cook for 1 minute, stirring constantly, until incorporated. Add the beer and beef stock and cook, stirring frequently, until mixture thickens. Taste and adjust seasonings to taste. Add red wine vinegar or lemon juice if needed to boost the sour in the sweet/sour balance. Typically the brown sugar and onions add enough sweetness, but add more sugar if it suits your taste. Cook carrots and potato chunks separately, adding them to the pot just before serving. Sauteed and browned mushrooms are delicious added to the recipe. Consider serving with buttered noodles and parsley OR serving over a mound of chunky mashed potatoes. Several recipes mentioned serving with french fries, but I put that in the unusual interesting category. A double recipe barely fed 7 people: the men went for BIG portions and second helpings. A fast and flavorful red-sauced pork chili with beans. Fall weather finally kicked in with windy gusts of rain and cool temperatures, but after 80 days of record-breaking dry, warm sunshine I'm not complaining. 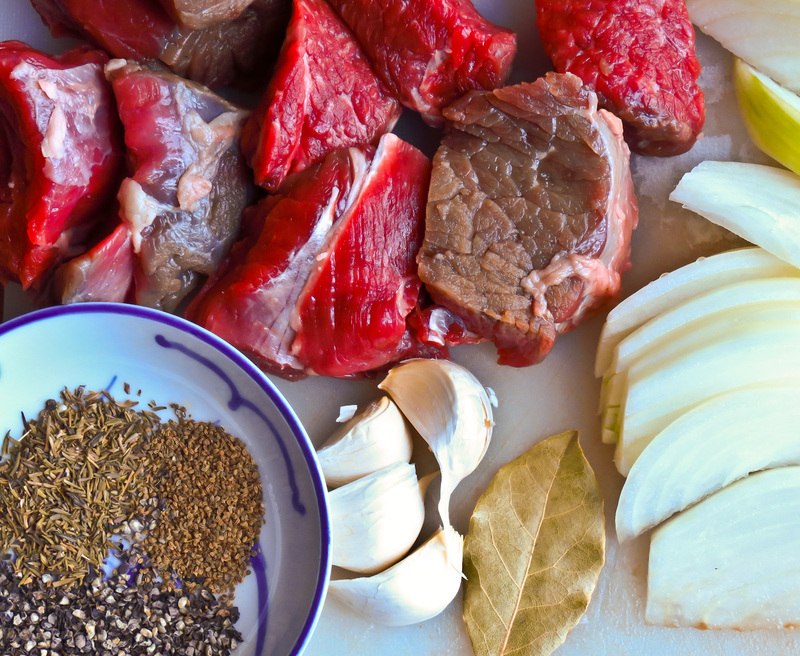 After all, this is the Pacific Northwest, and cooler weather just signals the beginning of slow cooking season, a time for soups, chilis and stews. Mmmmm, mmmmm good... except when you are in a rush and haven't planned ahead. Like yesterday. With a hungry husband and my own grumbling stomach for encouragement, I put together a new chili recipe for our late lunch. As he finished his second bowl of chili, RL asked, "Did you write down the recipe? I'll want this one again." ...few cooks, once they have mastered a recipe, want to do it exactly the same way twice--that's a pedestrian and boring way to cook....the main theme of the recipe is in your memory bank, and you can begin to have fun with variations of your own.Now you are really cooking. This quick chili is a bit non-traditional. My usual pork chili features tomatillos, not tomatoes... verde not colorado. In our local TexMex restaurants, chili colorado is all about beef, not pork. Chili beans are typically a side dish, an accompaniment and not cooked with the meat in the chili pot. No matter, we're not strict chili traditionalists, it's all about flavor. The ingredient list appears lengthy, but this is not a complicated chile. It's just 3 kinds of pork, some onion, seasonings, tomatoes and beans simmered in a broth. It is simple and quick to prepare, but oh! so tasty... and that's not just due to major hunger pangs before lunch. In a cast iron skillet or heavy-bottomed pot, saute the chorizo over medium-high heat until the fat is rendered but not until crispy. Remove and set aside. Leave the fat in the pan for its spicy flavor (or drain it off if you are a total chili wimp). 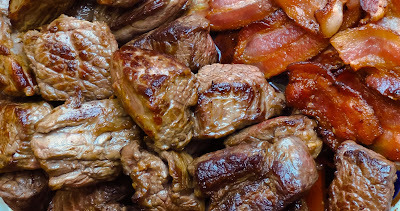 In the same skillet, cook the bacon and pork chunks until lightly browned on all sides. Remove and set aside with the chorizo. Leave the fat in the pan, you’ll need it for the onions and spices. Add the onion, garlic, poblano, oregano, cumin, cilantro, cinnamon, sugar and black pepper to the skillet and cook, stirring frequently, until the onions are soft and translucent. Return the meat to the skillet and add the tomatoes, chicken stock and beans. Bring to a boil; lower the heat and simmer uncovered for 45-60 minutes. Stir it occasionally and add water if needed (it might be necessary if the simmer is too vigorous). If the liquid needs thickening, dissolve 1 tablespoon masa harina in a bit of water and slowly stir the mix into the chili. Add the lime and chopped fresh cilantro and cook an additional few minutes. Serve topped with a handful of shredded cheese and a dollop of sour cream. Pass a basket of warm corn tortillas or crispy tortilla chips to accompany. Add more broth and a cup of frozen Mexicorn and this would be a hearty soup. Leftovers make good taco filling, nacho topping, huevos rancheros base or the best part of a chili dog combo. This is my first month participating in The Secret Recipe Club. I was assigned Katie’s blog, Betchacanteatjustone, to browse through and choose any recipe that appealed to me to make or bake and blog about. Other Group B SRC participants will post their recipe on the same designated reveal date. Now how fun is that?! The choice was difficult with so many tempting recipes competing for attention. Savory or sweet? Over-the-top decadent or practical? Quick and easy preparation or complicated? It took the enticing photo of a loaded cheese board displayed in a recent Dean and Deluca e-mail ad to make the decision for me: Katie’s Fruit and Nut Crisps were it for October. 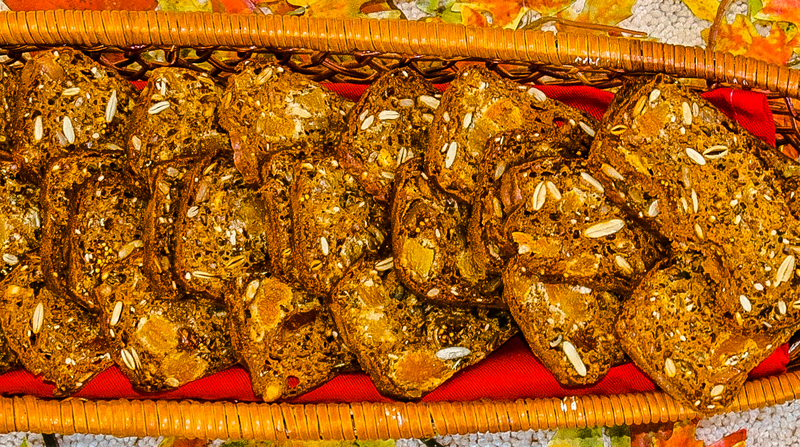 The cooking technique was similar to biscotti; bake a loaf, thinly slice and rebake to crisp up individual slices. Use the ingredient list as a set of possibilities and substitute other dried fruits, nuts and seeds according to personal preference and pantry supplies. 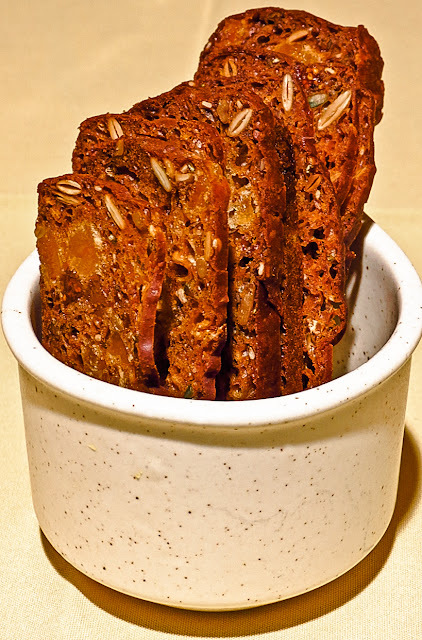 These crisps were delicious unadorned, but were truly sublime when topped with a creamy ginger apricot Stilton cheese and drizzled with honey… or a paper-thin slice of pear, a bit of chutney and crumble of brie… or manchego and fig jam… or... you get the idea. This recipe makes two standard size loaves, about 80-90 crisps, but you don’t have to bake them off all at once. 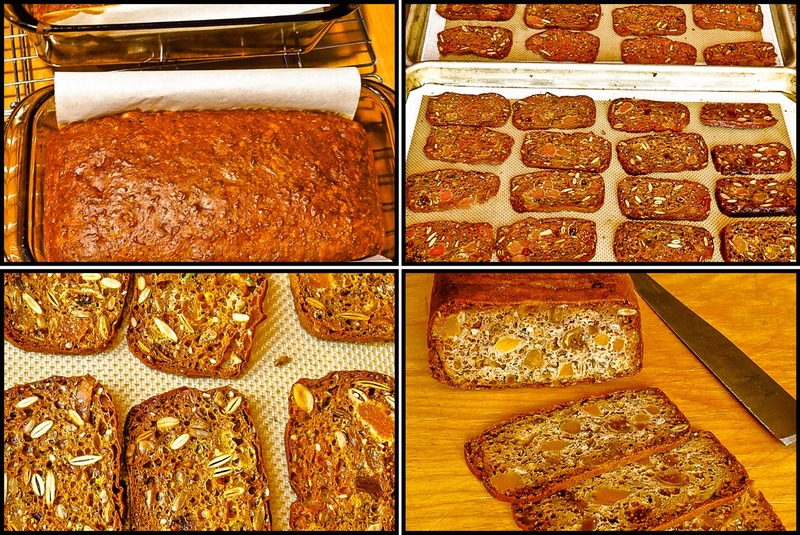 I popped one cooled loaf into the freezer to hold until we entertained the following week, and the results were just as tasty. It was actually easier to slice a frozen loaf than a non-frozen one! The husband enjoyed the crisps at breakfast, I loved them mid-morning with a cuppa, guests have enjoyed them as pre-dinner appetizers as well as cheese plate accompaniments, and someone nibbles a few late-night when no one is looking. Guess who. Thanks for the recipe, Katie. We love your sweet and savory crackers and I get to feel smug about not spending $7 to $10 dollars for one small package of prepared crisps at the store. In a large bowl, stir together the flour, sugar, baking soda and salt. Add the buttermilk (mix in the honey here if you’re using it). Stir together by hand. Add the fruits, nuts, seeds and rosemary: stir until combined. Pour the batter into the prepared pans and bake for 35-40 minutes until the loaves are golden brown and spring back when you gently touch the center. Remove the pans from the oven and cool for 10 minutes before unmolding onto wire racks to cool completely. Heat the oven to 300 degrees and spray or line cookie sheets.